We meet at the Deep water basin boat ramp in Milford, where we get into our suits and start the dive tour. 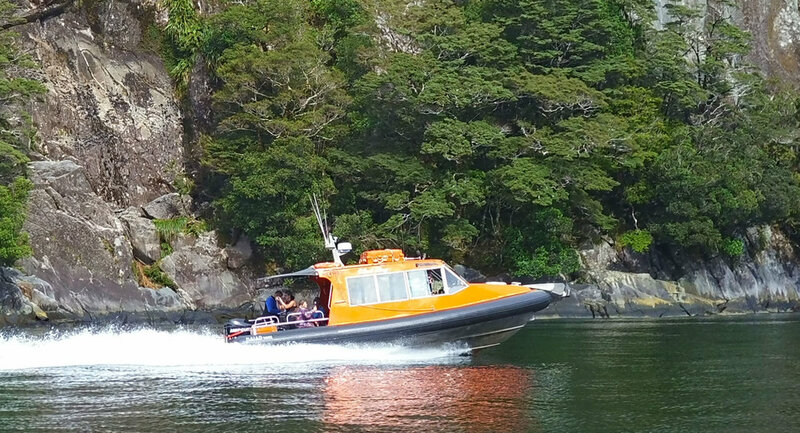 All our tours include a scenic cruise of Milford Sound all the way to the Tasman Sea. We explore several sites, waterfalls and wildlife for a closer look. We have about 12 dive sites to choose from that we regularly dive and choose depending on weather and conditions on the day. For your surface interval we supply hot drinks and snacks and for those on the double dive tour we have prepared a tasty vegetarian wrap for lunch. Piopiotahi (Milford Sound) marine reserve was established in 1993. It became one of the first marine reserves in Fiordland and covers 690 hectares along the northern side of the fiord from the head of the sound to Dale Point. Fiordland's marine system is considered to have the highest concentration of black coral trees in the world (the trees are actually white). Normally growing at depths of 100 metres plus, due to the large amount of rainfall draining into the fiords and the high mountains blocking light from the water these beautiful giant corals have migrated to shallower depths perfect for viewing by lucky divers. We have two dive vessels in our fleet. Westbay, our 9m NAIAD takes up to 10 divers plus 3 crew and Pacific Runner, our 6m Maitland Catamaran takes up to 6 divers plus 3 crew. Both vessels have dive ladders and toilets on board. Naturally oxygen and a first aid kit are kept onboard for safety. Arriving by car is the easiest option. Plenty of parking is available at our meeting spot in Deepwater Basin. For our 9am start time tour you can book the Tracknet bus option. The bus leaves Te Anau at 7:15am and arrives at 9:15am in Milford Sound which is fine for our trip and leaves Milford Sound at 5pm. For our 8am start time you can book transport with Trips and Tramps from Te Anau to Milford Sound in the morning at 6:30am, arrives at around 8:15am in Milford Sound which is fine for our meet times. You can then go back to Te Anau after the dive tour with Tracknet who have a departure at 5pm or with Intercity who have a departure at 3:25pm from Milford Sound with a stop in Te Anau which also continues back to Queenstown. If you come from Queenstown you will need to take a bus the previous day to Te Anau, overnight in Te Anau and then take the above option back to Queenstown or alternatively come to Milford Sound the day beforehand, stay in the Milford Sound Lodge and then return with Intercity the following day back to Queenstown. The Milford Sound Lodge is the only accommodation in Milford Sound which offers riverside chalet accommodation, backpacker-style rooms and a campervan park. The PioPio Cafe and Restaurant offers dining from breakfast till dinner. Books out well in advance so reservations are essential. Gunns camp nestled in the Hollyford valley is the next closest accommodation option with about a 1 hour 10 minute drive away. Gunns camp offers rustic accommodation including cabins, backpacker rooms, and open space for caravans and camping. History is truly alive with a museum attached to the camp and wood-fired showers and off the grid solar and generator electricity. Cascade Creek is the closest DOC campground to Milford Sound which has 120 non-powered tent sites and is about a 50 minutes drive from Milford Sound. Knobs Flat Accommodation offers eco-based accommodation in the Fiordland National Park including studio units and campsites. Knobs flat is about a 1 hour drive from Milford Sound. Te Anau is the closest town to Milford Sound and offers a multitude of accomodation options including a supermarket and many shops and restaurants. The drive from Te Anau to Milford Sound is around 2 hours.